When it comes to hair washing, I always mix it up. Back when I was a teen (oh how ancient I feel at the heavy past tense there! ), my hairdresser at the time told me that I should always change the shampoo and conditioner I was using regularly. The idea was that your hair somehow 'gets used' to the whichever formula you're using and it becomes less effective over time. A lot of shampoos coat your hair with substances like silicones, so I do think there's something in it. Ever since then I've regularly switched up what I use on my hair, with varying results. I have a little group of core favourites I rotate between (TIGI, John Frieda, Herbal Essences), but sometimes it's good to throw a wild card in and that's what I'm reviewing today. Molton Brown have always been a favourite of mine for their gorgeous bath products and if you were to go in my bathroom you'd find lots of their bubble baths and things. Their haircare and make-up, however, is not something I've tried. I'm not sure why. I guess I'm just wary when a brand I love so much expands into new territory. I don't want to be disappointed! With a product like this, I expect divinity. I expect results. The bar is set extremely high. 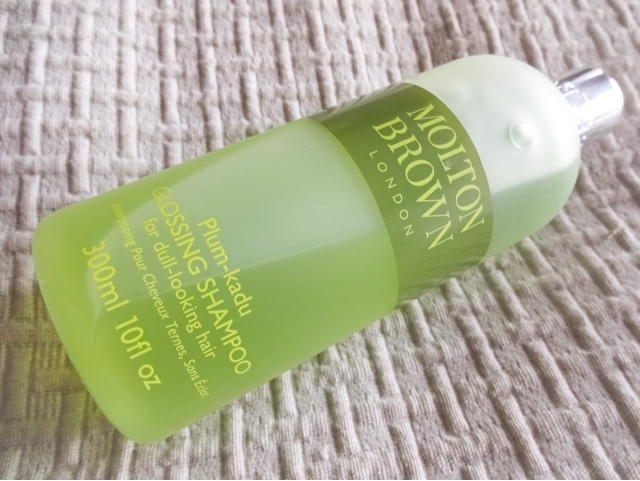 Would the Molton Brown Shampoo and conditioner leave me in heaven or out in the cold? I got the Plum-Kado Glossing Shampoo and the Indian Cress Purifying Conditioner to try it out and see. Molton Brown have eight different hair wash formulations, which is way more than I would have expected. Each of the variants is formulated for a different hair need, and all based around the effect of a particular natural extract. 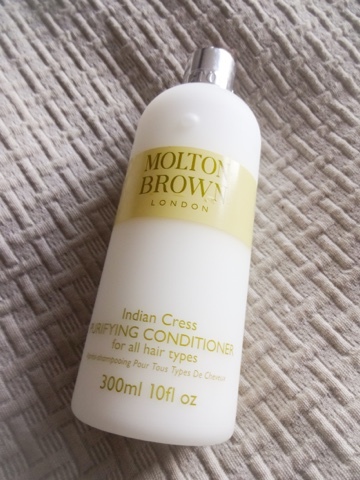 The Molton Brown shampoos and conditioners are priced at £18 each so they're certainly at the pricier end of the scale. There is Purifying Indian Cress, Volumising Kumudu, Ginger Extract Thickening, Fennel Extract Anti-Dandruff, Black Tea Extract Daily, Cloudberry Nuturing, Papyrus Reed Repairing and Plum-Kadu Glossing. You can choose to address one concern or you can cocktail them like I did- picking the Glossing Shampoo and the Purifying Conditioner. Plum-Kado is all about adding shine and combatting pollutants. Well obviously it's utterly beautiful and elegant, you really can't fault them there! The bottles are slim frosted plastic showing through the muted green and blue tones of the formulas- all as tasteful as a Farrow & Ball paint swatch. There are silver tops with a little taupe flip cap, just like on their shower gels. I really like these, mainly because they stop you squeezing out way too much product, which is what I always seem to do when it comes to shampoo. The packaging oozes class. Just having them in my shower makes the bathroom feel about a thousand times smarter! As you'd expect from a luxury brand, it's not just the packaging that feels premium here - the formulas are also pretty nice. For one thing, they smell expensive. It's not the genetic fruity or perfumey smell you're used to - these smell like a very subtle and sophisticated blend of aromatherapy ingredients, like a well-appointed spa or an understated perfume - not too overwhelming but rich in natural products. The scent of the Glossing Line is a bit sweeter and richer, while Purifying is more fresh and quite unisex, but both smell clean and expensive. In the Glossing line, the blend includes moringa seed, 'waterfruits' cardamom and sandalwood. There's Plum-kado fruit which is supposed to detoxify, amino acids to strip out environmental dirt and pollutants, and shine-boosting 'light reflectors' to add lustre and radiance. Over in the Purifying line, there are also amino acids, while Indian cress aims to improve healthy hair growth. There's also Jasmine and Honeysuckle, although bizarrely I find the scent less girly than the other! The shampoo is a light silky gel that foams easily even in my hard water area, while the conditioner is quite lightweight and doesn't feel overly thick. It might be the effect of the fancy scent or packaging but I felt like a little went a long way and also like some sort of spa treatment was going on while I was washing my hair. That's a nice feeling but I suspect it's to do with knowing you've spent nearly £40 on your hair washing stuff! Overall, these did perform very nicely. My hair felt extremely soft after using and I did think it was shinier. It also felt quite light and airy which is lovely- my pet hate is conditioners that weigh the hair down or make it feel greasy. Just no. I also live in a hard water area so it can be difficult to get things to foam properly and hard to get that very clean, silky just washed feeling up here, but these products really helped with that. I was happy with the result here and I think the formulas are pretty nice- but you'd expect nothing less for that price, no? These products are undeniably gorgeous. The swanky packaging and divine scent alone guarantee that you'll feel like you're having a spa day every time you step inside the shower, so for some that alone would be worth it. And while the formulas are also lovely and deliver what they claim to, I wasn't totally blown away. I think I've been just as impressed with much cheaper shampoos in the past- in particular the Herbal Essences Clearly Naked shampoo has a similar classy scent, lightweight feel and glowing finish. So I'm just not sure this did enough to make me love it. Yes, these are beautiful, luxurious and make you feel special just for washing your hair but I suspect a good deal of that is the knowledge that you've paid a fair whack for the privelege. Some people might find a holy grail here, and it's true these products leave a smooth, silky finish. But I'm just not sure any shampoo or conditioner makes that much impact. For a similar price point, I believe I'd rather use a salon brand, because they generally seem to take it to the next level in terms of added bang for your buck- using technology like keratin to repair stands and things like that. 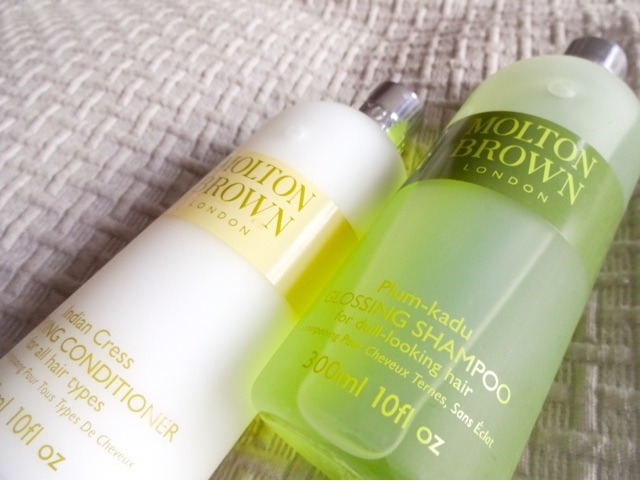 Molton Brown shampoo and conditioner, although they are gorgeous, are pretty no-frills. And perhaps that's all they have to be. There are no outlandish claims here. They're not claiming to move the earth after all- just deliver quality, divine smelling, attractively packaged hair goodies. And this they do deliver.